Experience a vacation with us in undiscovered, beautiful southeastern MT, on our real working ranch. No pop machines or curio shops here. We accept only one party per booking. Singles, couples and families welcome. Accommodations are 3 comfortable rooms with a shared bath in the family ranch home. Family style meals. 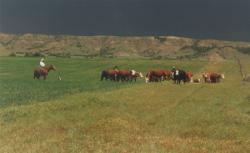 Relax, read, hike, and take part in horseback rides, checking cattle and other ranch activities. Directions: Rose Ranch is located in Southeastern Montana, near Ekalaka , in the Powder River Breaks. We are 244 miles from Billings Logan International Airport in Billings. 116 miles from Miles City, MT and 110 miles from Belle Fourche, SD, near the Black Hills of South Dakota.